Of course, the removal of gluten is your first step to brilliant health, though for some people this may not be enough. Compromising our gut and immune system may have led to deeper issues that may require more healing. When the protein ‘gliadin’ found in wheat and several other grains enters our digestive tract, it signals to the hormone zonulin, to open up the tight junctions in our gut lining. This essentially results in leaky gut, causing an immune response in our body, leading to inflammation. In some people, the tight junctions in their gut lining may close soon after exposure, though in others it may take months or even years to close. The exposure to gluten may also lead to microbial imbalances in your gut which can also lead to many other health issues. So what are some things you can do? Your gut houses roughly 2 kilograms of microbes which are absolutely essential to your health. Your gut can become heavily compromised through the exposure to a high carbohydrate diet, gluten, pesticides and antibiotics. A therapeutic probiotic or beautifully fermented foods can assist in replenishing the good bacteria to eliminate pathogens, enhance your immune system and assist in repairing leaky gut. A common chemical that can directly affect our beneficial gut bacteria and enhance the chance of overgrowth of pathogenic bacteria is Glyphosate, the main ingredient in herbicides that are sprayed onto wheat crops. 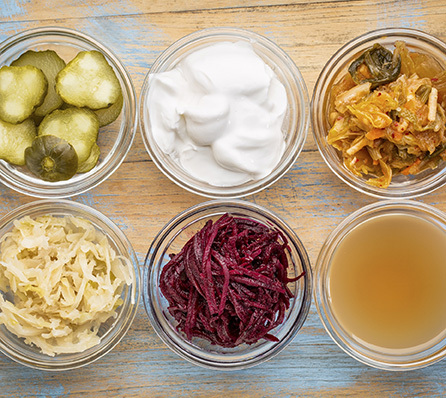 By having fermented foods and probiotics, it will add beneficial microbes into your gut enabling you to digest and absorb your food efficiently, produce mood regulating hormones effectively (like serotonin, melatonin, dopamine), as well enhance your immune system. It is best, however, to seek professional advice regarding which probiotics and fermented foods are best for your gut. Your gut flora is essential to your overall wellbeing. We provide a home for the microbes, and they provide a life for us. Antibiotics, chlorine, preservatives and some cleaning products are items that will damage your gut flora and I strongly recommend you avoid these as much as possible. This will ensure your gut flora and gut lining continue to bring you the best health possible. These foods are rich in proteins that are exceptionally healing to the gut lining. They contain specific amino acids that rebuild the intestinal tract which helps to rebuild the damaged lining. These foods also enhance gastric acid formation, allowing you to digest your food efficiently. If you are still experiencing symptoms, you may have developed an overgrowth of bacteria, parasite or yeast or a combination of these. Through the guidance of a health practitioner, I recommend for you to adhere to strict dietary guidelines and use antimicrobial herbs to eradicate the overgrowth. This will allow your intestinal tract, stomach acid and digestion to normalise over time. As you’re aware, gluten has inflammatory properties and is in most ‘modern’ packaged food items. However, there are certainly other inflammatory foods that you need to think about avoiding in your healing process such as corn (particularly if it is not organic), soy, dairy, nuts that aren’t activated, grains that aren’t prepared properly, vegetable oils and vegetable fats, as well as other foreign additives such as flavours, preservatives, colours and dextrose. These may also aggravate the gut and cause inflammation, particularly if your gut has been damaged over many years. If you have an autoimmune disease, then nightshade vegetables also may be a problem for you, which include; eggplant, peppers (not including blacked cracked pepper), white potato, goji berries and tomatoes. The removal of gluten is one of the first steps to eliminate inflammation on your body, helping to bring your body back into homeostasis (balance). When you are ready, begin to follow the other steps which will ensure you continue to heal and thrive. In the end, it is about moving towards the way we use to live; traditionally, simply, without chemicals and with beautiful real, fresh food that is without human interference. Thank you for sharing this invaluable info we all need to get back to the basics for the sake of our health and our children’s health. Great info Cindy, thanks for keeping us all informed, so we can make good food choices. It’s too hot for me here in Brissy for bone broth! but I’m looking for a great probiotic, the market is flooded with with them – any suggestions? I was retired at 55 with continual stomach pains.My doctor told me that they knew less about the stomach than any other organ in the body.24 of the last 25 years I have been suffering.Since last year,having cut out most wheat products, relatively free of problems.An occasional cake does not have any effect although pastry causes real problems.Potatoes and tomatoes also have an effect.Also stopped haveing milk and no more tiredness in legs.No more BP tabets. Also anti acids and statins.No headaches. Unaware of the goji berries. Thank you for your helpful information. Regarding point 2 – things that destroy gut flora. When you mention chlorine, do you mean the chlorine in our drinking water (which I filter) or is the chlorine in our bathing water just as destructive to our gut? Also, what specific cleaning products are you referring to? I have eliminated all chemical cleaning products other than anti-bacterial wipes for the toilet (I love a clean toilet) and the occasional use of bleach. Is that ok? Your skin is your largest organ taking in chlorine, fluoride, glyphosate and all the chemicals from the water plant. If you touch the toilet wipe you take that in unless you use gloves. You are breathing the chemicals, worst of which is not the chlorine but the petroleum based fragrance. You will notice that every brand of bleach smells different. Chlorine is chlorine but the perfume makes you choose your favorite to use. You can clean the toilet with water, baking soda, dish soap. For more information see Beet Bridges, RN! British dialysis nurse sickened by fragrance in disinfectant spray used after patients. She gave information on her own various websites about the dangers of fragrances which caused her to be disabled. What are the symptoms of ‘leaky gut’? Bone broth gives me heart flutters, any suggestions?? Many thanks Diane, I’ll look for it. I ended up getting some from my Naturopath, but at $70 for 30 tablets, it’s not cheap.